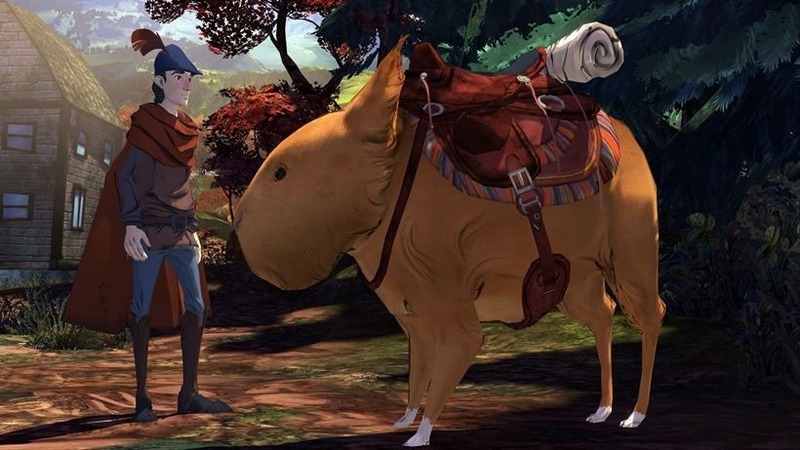 I have terribly fond memories of playing through the original King’s Quest games, sitting with family, huddled around a PC screen trying to come up with solutions to the game’s often obtuse puzzles and nasty instant deaths. 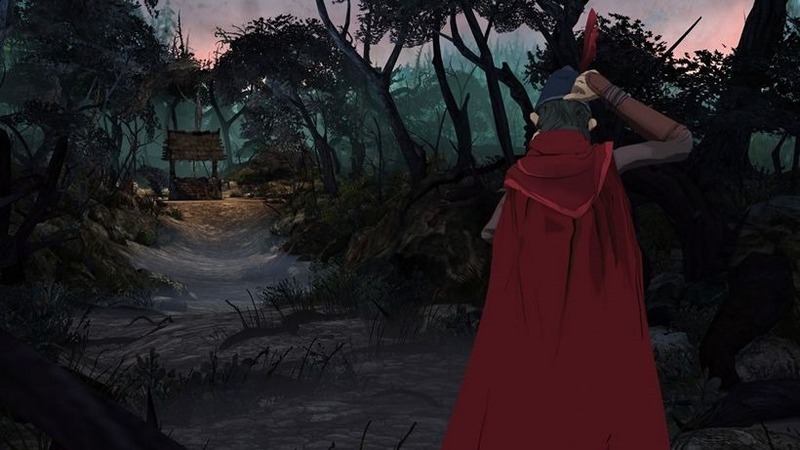 It was with more than a bit of trepidation that I approached The Odd Gentlemen’s modern retelling of King’s Quest. It looks beautiful, with a unique fantasy aesthetic, and its voice cast is certainly appealing, but I was terribly worried that the game wouldn’t live up to my nostalgia, or that worse, the game wouldn’t be respectful of its heritage. I’m glad that my worry was for naught. From the onset, it becomes clear that The Odd Gentlemen approached the game with reverence for Roberta Williams’ classic point-and-click adventures. It’s more of a reboot or retelling than a remaster, focusing on Graham before his ascension to the Throne. You’ll play as hopeful knight Graham – a charming, bumbling, perhaps overzealous young chap – as he tries his damnedest to best other hopeful knights, by backtracking his way up and down the Kingdom of Daventry. It’s a story told by an unreliable narrator in the form of an elderly Graham, recounting his adventures to granddaughter Gwendolyn. 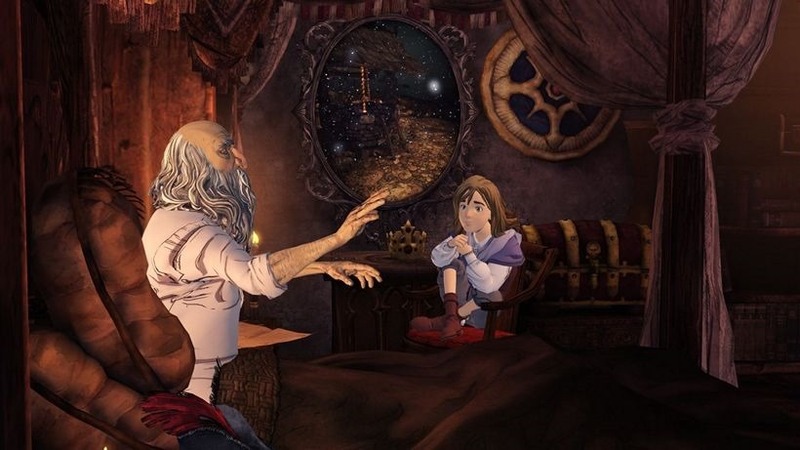 Played to perfection by Christopher Lloyd, the grey-haired former adventurer drops terrible puns, as the young child regularly breaks up the tale with questions of veracity. “It was not exactly as I remembered it, but it wasn’t all that different either,” the elderly Graham says early on in the game, setting up the tone rather wonderfully. The whole narrative setup echoes The Princess Bride, with the game having a similar story-book sense of wit and whimsy. The game even features Wallace Shawn, inconthievably voicing a pint-sized knight-in-training. It plays, for the most part, as a traditional point-n-click, with the only two buttons at your disposal being one to interact with objects, and another to access your inventory. As with games of that sort from a time long ago, you’ll spend most of your time clicking on everything, trying to find solutions to infrequently mind-bending puzzles. There are sometimes multiple ways of solving puzzles, with one of the game’s earliest giving you a few options, which in turn slightly changes the way the story plays out. It’s not nearly as unforgiving as the older games, with only a handful of the game’s puzzles requiring the sort of frustrating leaps in logic that old-school adventure games relied so heavily on. There is still that trademark King’s Quest instant death, though the game’s generous check-pointing means you’ll never have to load an old save having lost hours of progress. “That’s what would have happened if I turned the left switch. But since I am here telling this story, you already know that I pulled the right one,” Graham will recount to his rambunctious kin after you’ve gone and pulled the wrong lever, resulting in a comically unfortunate death. The game will frequently kill you off, but it’s always wonderfully handled, bringing you back to right before you died. But just as the narrative skilfully blends old and new, so does the game’s mechanics, which occasionally flit in and out of other genres, breaking up the sleuthing with a bit of platforming or the odd quick-time event. The game even flirts with a bit of role-playing, giving you dialogue options that change how future events play out. It may seem a bit of hodge-podge, but I felt the game struck a perfect balance between its arcade, quick-fingers gameplay and traditional adventuring. There are some bits that annoy though; one sequence that had you trying to trip up one of the knights using a ball of yarn was gruellingly annoying, and the closing game duel made me want to bash my head against my desk. There are moments of frustration, and times where it feels like you’re tracking back and forth all over Daventry trying to find the right McGuffin. While that’s a valid complaint, it’s the sort of stuff that’s at the heart of what made those old adventure games so appealing. I’d have liked a bit of quick travel, as getting from one end of Daventry to the other can sometimes feel like more of a chore than it really is. There are some other things that might put modern gamers off, like a complete lack of anything resembling a quest log, no hints and no popups. There are, however, some long load times and some frequent screen tearing on the Xbox One, but neither was distracting enough to detract from what was a wonderful experience, filled with frequently charming, often downright silly characters that are reminiscent of Monty Python’s Quest for the Holy Grail. It’s being called episodic, though The Odd Gentlemen wish to stay away from that nomenclature, and for good reason. A single playthrough of the first chapter will take the average human between five and seven hours, which is far more game than the average lunchtime break a single episode from Telltale’s adventures will net you. And honestly? For an old-school adventurer there’s a lot to love here. 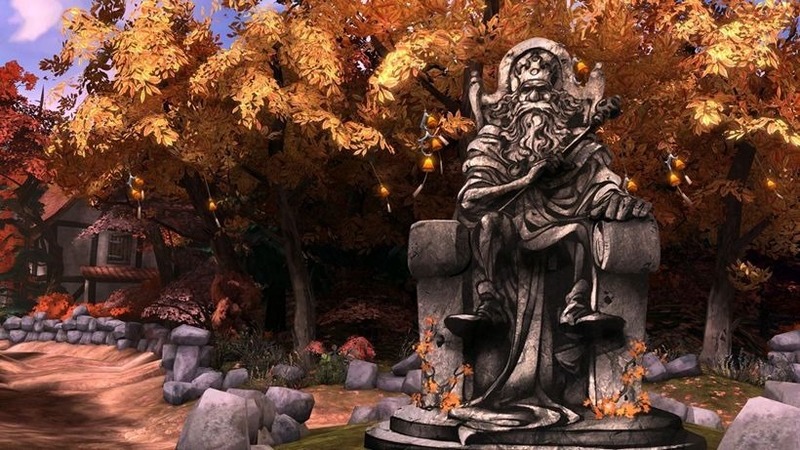 If The Odd Gentlemen can keep the quality of writing and personality up for all five of the game’s chapters, they’ll deliver an adventure game classic. It’s filled with wit and whimsy, and heartfelt storytelling – and I can’t wait for Chapter 2. 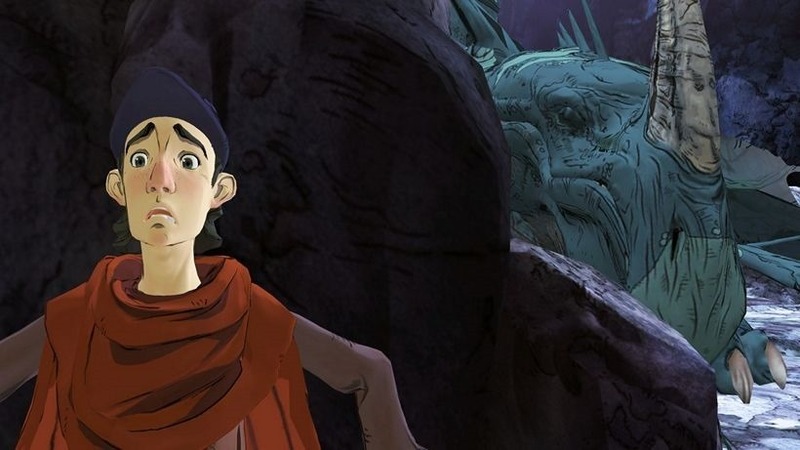 Though not as brutally challenging as its forbears, the first chapter of The odd Gentleman’s King’s Quest is a delightfully charming, funny and beautiful game that any fan of old adventure games will love.